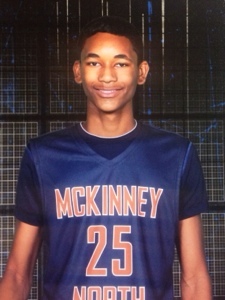 One of fastest rising 2017 Student Athletes out of the State of Texas is Jared Pearre 6’6″ Wing/Forward McKinney North HS. Jared, has been showing out and caught the attention of Mid Major Hoops Report this High School Season. Mid Major Hoops Report invited him to our “Players Corner” where we at MMHR are proud to highlight him as one of the up and coming prospects in the 2017 Class…. Long arm, Long leg Wing who is very athletic reminds me of a young Stacey Augmon, good in transition will be able to guard 1 through 4 spot at next level. JP: I am very active on defense and block or alter several shots per game. Offensively I have a very good mid-range game and have the ability to knock down three-pointers. JP: My ability to see the court and anticipate plays which often leads to me blocking shots or deflecting passes. JP: As a high-school freshman I am still early in the process and would not consider any of the schools that have shown interest as “strong”. However, I have received some interest from some of the local universities. JP: Currently there have not been any coaches that have made an impression that would cause them to stand out from the rest. JP: As I stated earlier, me and my family are still very early in the recruiting process and have not started narrowing down schools yet. JP: I have not gone on any visits, but this summer my parents and I are planning to visit some of the Universities here in North & Central Texas. JP: Although close to home would be nice, the physical location of the university will not be the primary factor when I make my college choice. JP: I would consider myself a hard worker. I pretty much work on my overall game and basketball skills year round. JP: I don’t know when I actually first picked up a basketball, but I first starting playing organized basketball when I was 4yrs old and joined the team that my older brother was playing on. JP: The quality of the educational system and do they offer the curriculum for the major that I wish to pursue. JP: My parents have been my most influential mentors; however, my older brother and my AAU & High School coaches have also assisted me in getting to where I am now. JP: My favorite moment occurred this year when I got my first in-game dunk. JP: My short term goals are to continue to improve my all-around offensive game and to improve my physical strength. JP: My long term goal as a basketball player is to secure a scholarship at a D-1 university and to graduate with a quality education. JP: Not at the moment. JP: I prefer an Up tempo style of play. Special Thanks to the Pearre family for allowing MMHR to Q&A with their son Jared Perry. We wish him a Good Luck on the rest of his school season. Please keep in touch with us on his recruitment.